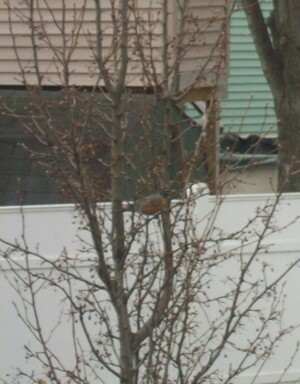 My wonderful husband and I always search for the first "Robin"of Spring. This year is the first year I spotted it, I got lucky ! If you look close in the tree you will see it. Buffalo winters are long here and so the Robin was a beautiful sight to see! I grew up in northern Illinois and I always wondered where the robins went in the winter. We always heard that they "flew south" for the winter. Now that I live in Florida, I know where they go. Every December my back yard is crowded with robins. I live pretty far down on the southwest gulf coast. They must go somewhere else after stopping here, though, because I never see them other than for a few short days in December. I love seeing them; reminds me of back home, I guess. When I see the blue herons fly over my pond I know spring can't be far. Now I'm awaiting my blue birds and little "hummers" to officially welcome the season!